Sizes selected from the drop down menu. 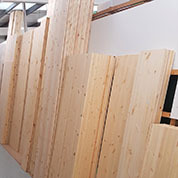 Solid pine utility timber board suitable for all internal DIY projects. Strips of timber glued together to achieve the board width. They are only suitable for internal use. They can be painted or stained.